In addition to writing my own books, I translate from Portuguese and Spanish into English. I started out translating song lyrics for a bilingual radio program on WRPI and now translate picture books, novels for children and teens, and scholarly articles in the social sciences. My picture book translations have received numerous accolades, and I’m always looking for new books to bring to English-language readers. 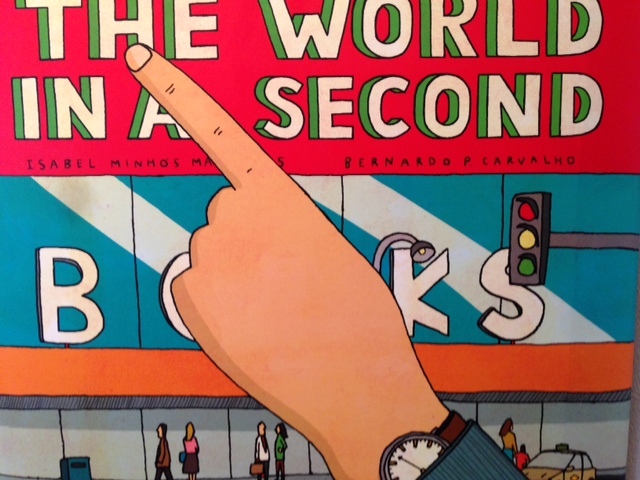 The World in a Second, first published in Portugal as O Mundo Num Segundo, was my debut translation. Through large-format illustrations and concise text, it portrays the many events that take place at the same moment around the world. Depicting 23 different places, some of which are named while others are represented through clues only, the book invites us into routines, habits, cultures, and landscapes that reflect our diversity as well as our similarities. A world map at the back of the book helps fit the pieces together by locating each illustration in place and time. Martins, Isabel Minhós. The World in a Second. Illustrated by Bernardo L. Carvalho. Translated from Portuguese by Lyn Miller-Lachmann. Brooklyn, NY: Enchanted Lion Books, 2015. ISBN 978-1-59270-157-5, $18.95 hardcover. 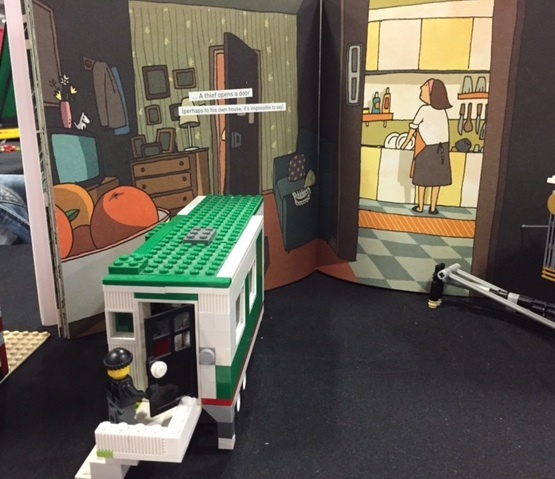 A 3-D illustration of a spread from The World in a Second using LEGO pieces, on display at New Jersey BrickFestLive. First published in Brazil in 1987 as O Menino Que Aprendeu a Ver, and now in its ninth edition in Portuguese, Lines, Squiggles, Letters, Words is the story of Pedro, a wide-eyed child who looks out at the world with curiosity and pleasure, finding it endlessly surprising. But there is mystery too, as in the puzzling pictures he sees, made up of elusive lines and squiggles. When Pedro starts school, his great curiosity grows even greater with each letter he learns. Suddenly his world is changing, as the lines and squiggles become letters and words. 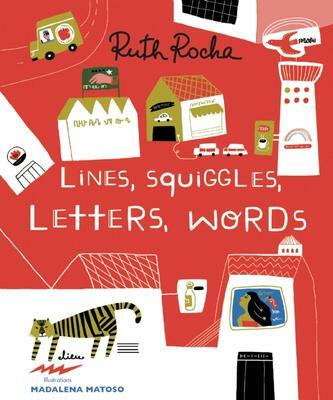 Rocha, Ruth. Lines, Squiggles, Letters, Words. Illustrated by Madalena Matoso. Translated from Portuguese by Lyn Miller-Lachmann. Brooklyn, NY: Enchanted Lion Books, 2016. ISBN 978-1-59270-208-4, $16.95 hardcover. The author and illustrator are Italian, but The Queen of the Frogs was first published in Portugal as A Rainha Das Rãs. When a mysterious crown falls into a pond, the little frog who finds it is instantly pronounced the queen. But when her royal subjects start to question her authority, she must prove she’s fit to rule — if she can. Cali, Davide. 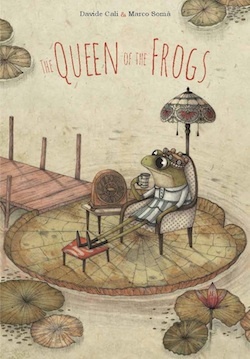 The Queen of the Frogs. Illustrated by Marco Somà. Translated from Portuguese by Lyn Miller-Lachmann. Grand Rapids, MI: Eerdmans Books for Young Readers, 2017. ISBN 978-0-8028-5481-0, $16.00 hardcover. 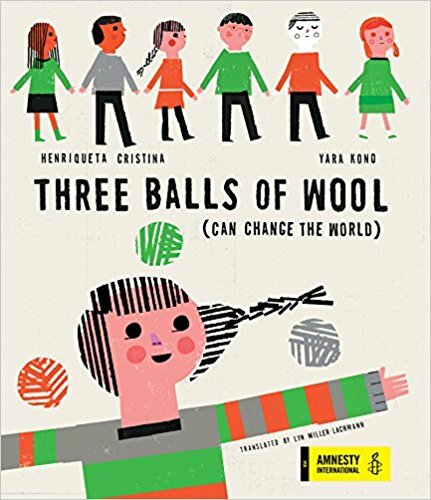 Three Balls of Wool (Can Change the World) is a story that is very dear to me. Published in Portugal as Com 3 Novelos (O Mundo Dá Muitas Voltas), it’s based on actual events and follows a family that escapes the dictatorship in Portugal in the late 1960s, seeking freedom and a better life. Their journey takes them to Communist Czechoslovakia, where “all children go to school.” But while the children go to school, people don’t have freedom of choice or the right to speak their minds. Refusing to accept a life without freedom, the mother gets to work, turning a bleak reality inside out and upside down. In the end, these refugees spark a movement for change in their community. Cristina, Henriqueta. Three Balls of Wool (Can Change the World). Illustrated by Yara Kono. Translated from Portuguese by Lyn Miller-Lachmann. Brooklyn, NY: Enchanted Lion Books, 2017. ISBN 978-1-59270-220-8, $16.95 hardcover. 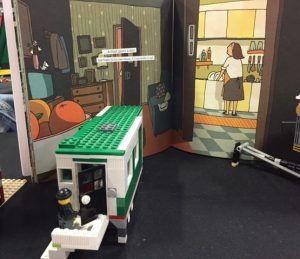 What to do when your little one won’t go to sleep? Based on sleep science and written by an internationally-renowned pediatric clinical psychologist, this soothing bedtime story models deep breathing, visualization, progressive relaxation, and more. 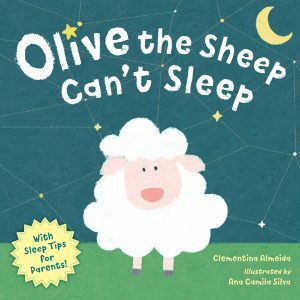 Includes expert sleep tips to create a healthy bedtime routine that’s good for the whole family! Almeida, Clementina. Olive the Sheep Can’t Sleep. Illustrated by Ana Camila Silva. Watertown, MA: Charlesbridge, 2018. ISBN 978-1-58089-838-6, $12.95 hardcover.